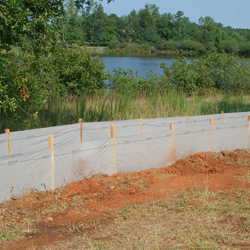 Foster Supply provides all the necessary components for a Super Silt Fence system. Parts include woven or nonwoven geotextile filtering media, chain link fencing, gavanized steel posts and fasteners. We have a complete line of chain link products to meet the requirements of the most severe jobsite conditions or standard products to lower your cost. Posts are available in many different selections and are customized to customer needs to reduce costs. If you have specific questions or would like suggestions call our location nearest to you for more information.